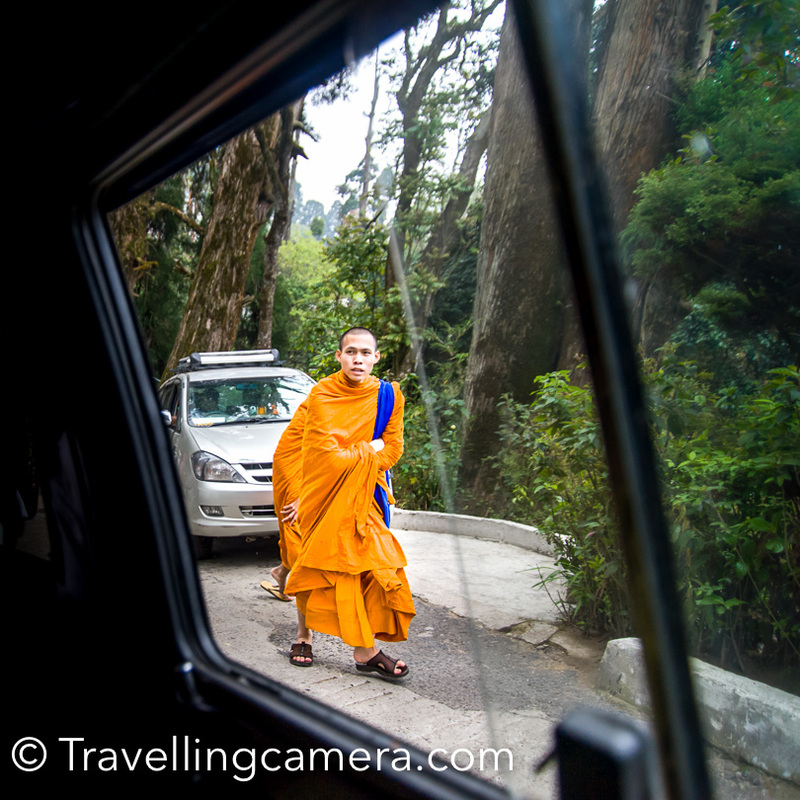 Before our trip this year, Darjeeling sounded like a faraway fantasy land with amazing landscape and sparse human population. The toy train too chugged through this fantasy landscape in our imagination, mostly because of the song "Mere Sapno Ki Rani". 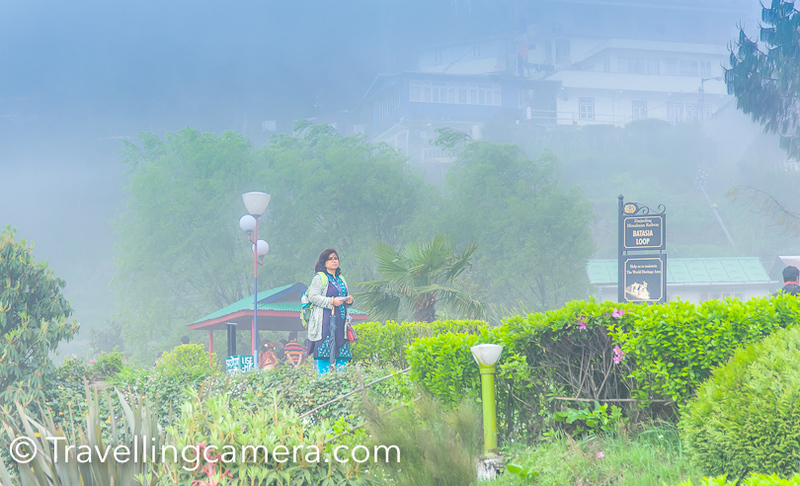 Darjeeling of our imagination and Darjeeling in reality turned out to be much the same, except the population part. The town is extremely crowded and the most of it is because of Tourism. 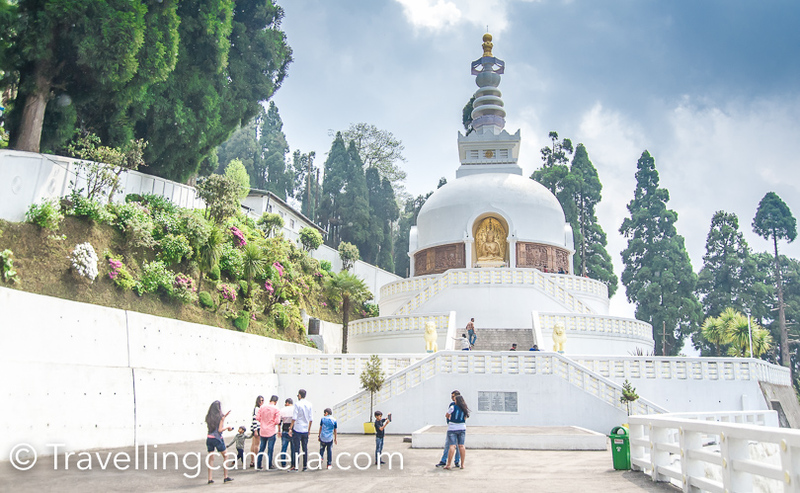 We explored Darjeeling mostly on foot, except for some faraway places like the Japanese Temple and Peace Pagoda, which is about 15 minutes drive from the Darjeeling Mall. We were walking around in the first half of the day and hired a cab for the second half. In all, this approach worked out well and we were able to explore almost the entire city in one day. Though it had mostly been sunny during the first half, clouds had gathered by the time we had lunch and when we reached the Japanese Temple and Peace Pagoda, it was drizzling. The tiny raindrops were refreshing and though it threatened to start pouring any moment, we decided to take our time walking around the vast premises. The Japanese temple is a tiny, two-floored building, built in traditional Japanese style. Inside the temple you will find some scrolls with Japanese kana and kanji script on them. Photography is allowed inside the temple. However, it is not allowed inside the prayer room when the prayer is on. 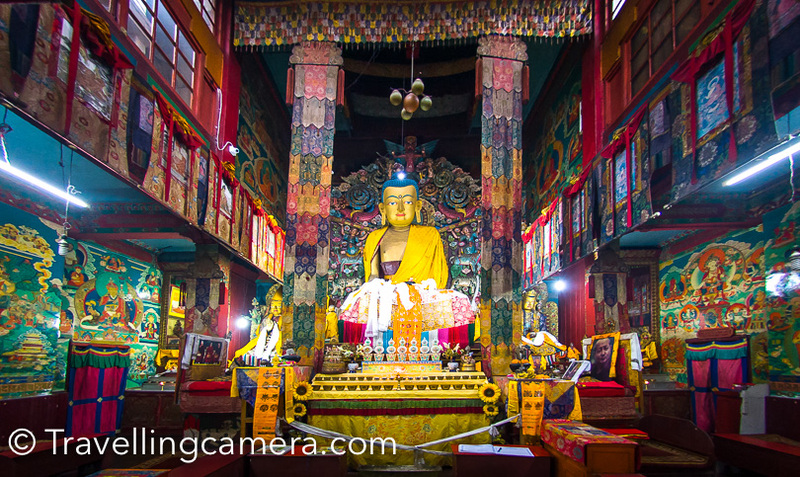 Inside the prayer room, you will find several statues of Buddha in various positions. The room is vibrant with red, gold, and brown colors dominating the scene. The building is mostly silent as people prefer to quickly move on to the more prominent Peace Pagoda. The Peace Pagoda is visible from a distance. Structurally it is like any other Pagoda, adorned by carvings of Buddha in various stages of his life. The statues and carvings are gold and bronze on white marble. When seen from a distance, it is a striking structure. When up close, it is quite imposing. You really can't take it all in at one go. When we started our walk back to the parking, it was still drizzling and we suddenly realized that the place would perhaps been a little dull had it not been for the perfect weather. I can't imagine visiting the pagoda when the sun is out in summers. All that marble would probably make it too hot. The drizzle balanced it out and also added to the romance. 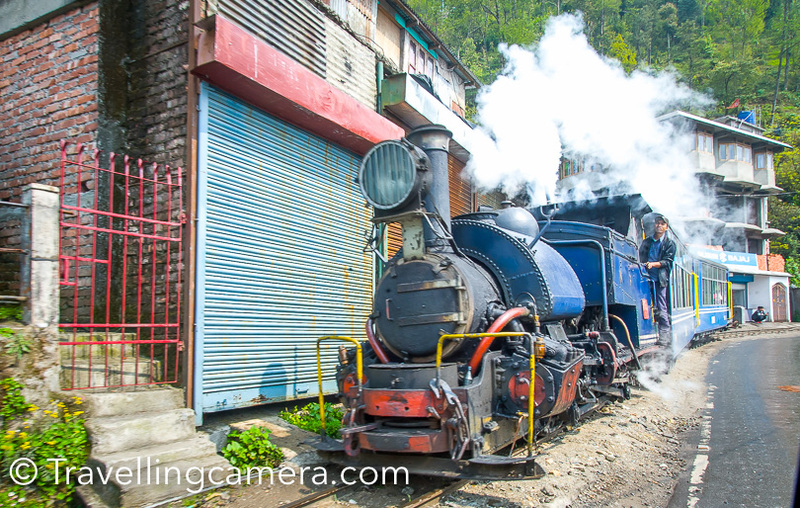 Next, we were headed to the Batasia loop, which is another interesting spot in Darjeeling if you reach there at the right time when the train passes through it. Without the train, it is just a small park. We got there when the train had just passed and wasn't due for another couple of hours. This is exactly the reason why one should do thorough research before visiting a place. Anyways, more about it in the next post. Till then, take care. 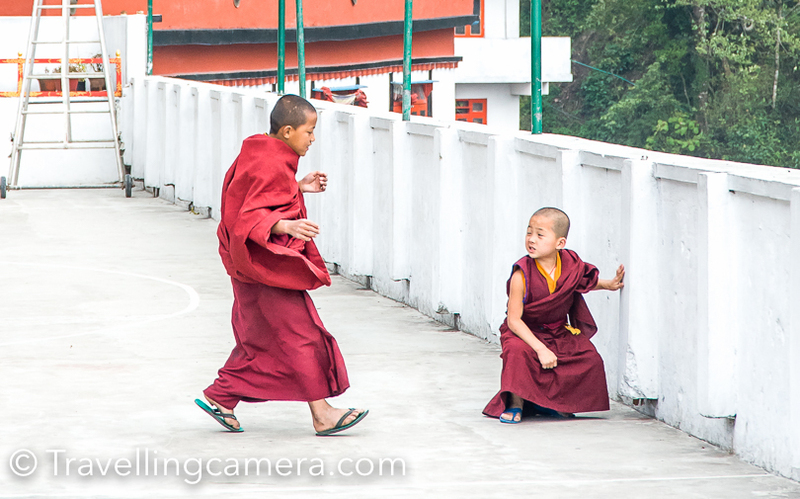 Exploring Darjeeling on feet is really a tough job. Though you have managed to visit most of the places. Thanks for sharing your experience.